I volunteered to listen to the audio version of this book, expecting a thriller, but not expecting the level of violence that it contains. In fairness to the author, the violence was up-front and in-your-face right from the beginning and under all normal circumstances I would have closed the book there and then. However, I tend to complete audiobooks more often than the written word, so I persevered. An unfortunate teenage boy from a peaceful, if poor family, becomes embroiled in a gang situation where life is cheap and revenge is all. He was in the wrong place at the wrong time and mouthed off a bit too much. As a result, he and his family become targets of a ruthless mob and find themselves fleeing for their lives. 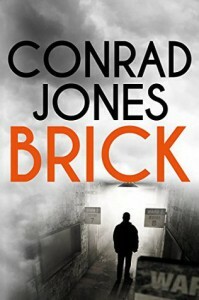 My friends read 'body-count' books and we joke about the number of bodies eliminated by the author during the course of the book - well, I have to say I lost count with Brick, there certainly weren't many left to bring to justice by the end. If you're looking for dark and brooding with an ominous presence, then this may be for you; if it's a frantic page-turner you're after, then, no, I didn't find that with this book, it didn't grab me and I'm sorry to say, even the ending was a bit flat. Notable comment for the narrator, Diana Croft, who nailed the Northern accents.